AstraZeneca, a science-led biopharmaceutical business is committed to saving lives through innovative science, collaboration, and exceptional service delivery. Known for developing medicines that have helped millions of patients all over the world, AstraZeneca recognises that the energy and passion of its people are the reason behind the company’s achievements. In an effort to continue to innovate and deliver life-changing medicines, AstraZeneca believes in attracting high-calibre graduates who can help the organisation make a genuine difference in years to come. With this in mind, our client offers a wide range of exciting graduate career paths and opportunities for growth. In the past, AstraZeneca has relied on individual brochures (one brochure per main function, or division) to reach graduates. 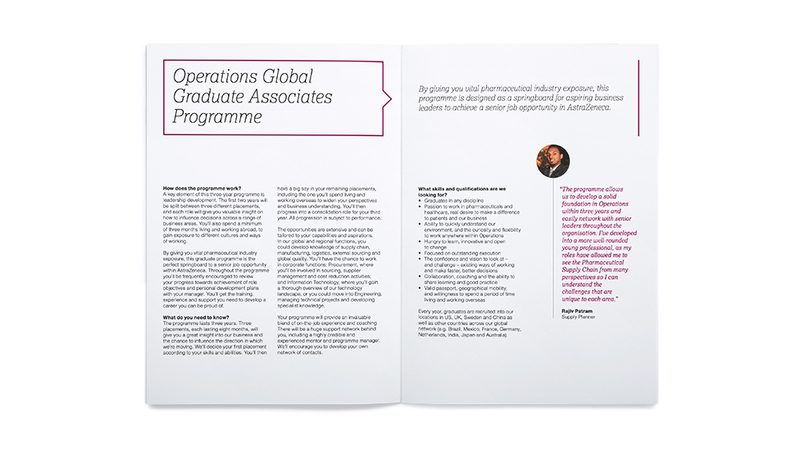 This time, AstraZeneca felt that combining them all into one, easy to handle brochure, would simplify the process – particularly important at a time when fresh graduates face often difficult, life-changing decisions. The new careers brochure design also had to present AstraZeneca as a unified and exciting company where ambitious individuals can build fulfilling careers. It needed to attract talented graduates, and inspire the next generation of scientists by presenting AstraZeneca as a diverse organisation driven by innovation in science. We created an authoritative and at the same time fresh and vibrant careers brochure design that immediately attracts graduates thanks to a simple yet comprehensive design, and a manageable and easy to carry A5 format. 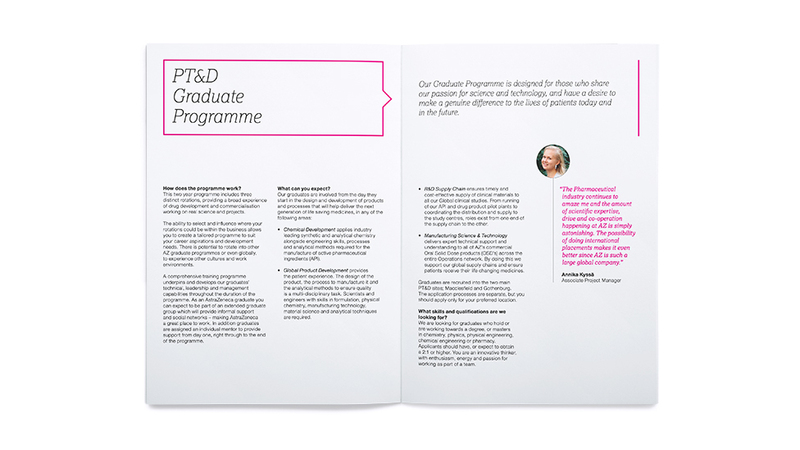 Brimming with design and content features – strong headlines, beautiful images, photographs and quotes from past Graduate Programme alumni – the brochure, and its magazine feel, immediately captures the attention of graduates at busy careers fairs. As a starting point, the design follows AstraZeneca’s guidelines for talent acquisition, where there must be a balance between people photography and scientific images. Interpreting the guidelines further, we placed key statistics in colour boxes to make them stand out on the page and communicate their importance. Each of the functions presented in the brochure has its own personality, standing out as individual propositions in their own right. At the same time, and thanks to a consistent design and structure treatment that runs across all of them, AstraZeneca is able to deliver a message of unity and collaboration. Each function is introduced with striking scientific images, and photographs of employees looking directly at the camera – the reader – transmitting a welcoming message. The sensation that dialogue between AstraZeneca and graduates has started is reinforced by graphic elements that subconsciously remind readers of a speech bubble and instil a sense of action. A double page spread introduces each function, where images and enticing and informative copy sit next to stats that help communicate the magnitude and scale of what employee contributions help achieve. As graduates turn the pages, the use of colour helps to visually identify new potential career paths. We used AstraZeneca’s brand mulberry colour to introduce the Operations function, a subtle nod to this being the heart of the organisation, despite its non scientific focus. Testimonials and photos of real employees help represent AstraZeneca’s diverse workforce. This also helps transmit how the company encourages moves across its global locations. The careers brochure design includes a QR code that links through to AstraZeneca’s Graduate Careers web page, making it really easy to find out more information. We also managed the print and fulfilment of 10,000 copies of the brochure.